“Tools and Services for energy management”, with crucial information about tools to all those who want to improve ICT energy efficiency in their business. In less than an hour, Jaak Vlasveld (Director of GreenIT Amsterdam) and Rahib Bashroush (Coordinator of Eureca project) - will provide their valuable insights regarding energy efficiency in ICT. Jaak Vlasveld will explain how to achieve energy efficiency gains without impacting the performance and stability of ICT and the potential impact of Life Cycle Assessment on buying new IT equipment. Rahib Bashroush will provide his expert advice on the sustainability of data centres, which will explain how to identify and procure environmentally sustainable data centres. Today the services, or tertiary sector, is driving the European economy, generating around 70 % of EU GDP and employment . It’s Energy Consumption has been growing continuously since 2008, with just trade premises and offices clocking up over 50%. Hence the importance of making this sector more energy efficient and reducing its carbon footprint. Energy efficiency has become a new resource itself: it’s competitive, cost effective, and widely available. But, it seems that 74% of people think that organisations are still not doing enough to cut their carbon emission and tackle climate change . Lack of knowledge and financial constraints are two of the main reasons behind this. Being aware of your organisation’s footprint will allow you to reduce sources of carbon from your company’s operations and start planning a carbon neutral journey. So how do you get started? The ICTFOOTPRINT.eu webinar will ensure you’re on the ball in low carbon footprint. Jakub Bartnicki: Energy & Built Environment Services Manager at Bureau Veritas, will introduce the Green Rating for Energy Performance Contracts, a technical and financial assessment methodology developed through the Horizon2020-funded Trust EPC South project. Adina Braha-Honciuc: Government Affairs Manager – EU Policy at Microsoft, will showcase the Microsoft Carbon Fee report. The company reduced energy and emissions, bought clean energy to cover what it could not reduce and invested in offset projects for the carbon Microsoft cannot reduce or replace. These efforts are funded by Microsoft internal carbon fee, which charges all Microsoft’s business groups for their carbon footprint. Derek Webster is the Yahoo! EMEA Head of Data Center Development, CEO at Data Center Consultancy Andget. Derek will demonstrate how formula one (F1 DC) Designs can reach the Enterprise Site with Macro Green to ROI benefits. 27 June 2017, 12:00 CEST webinar on how to improve ICT energy efficiency in your business. Want to become more sustainable in ICT? Alex Bardell, Member of Executive Board at Sustainability for London, will focus his presentation on Data Centres standards, reviewing them in relation to energy efficiency and sustainability. His insights will help you understand what standards are and how they can help you reduce energy and carbon consumption. Silvana Muscella, founder/CEO of Trust-IT Services and Project Coordinator of ICTFOOTPRINT.eu, will introduce the Self-Assessment Tool for ICT Services (SAT-S). SAT-S is a useful, free, quick and easy-to-use tool to calculate the carbon footprint of ICT services. It is a practical tool for ICT-intensive organisations to position their ICT services footprint. Silvana is the driver behind the development of useful digital tools and services for smaller companies, in several ICT areas, such as energy efficiency, and especially useful for helping novices make their ICT more sustainable. The final version of SAT-S is planned for June 2017. Andie Stephens, Senior Customer/Project Manager at Carbon Trust and member of ICTFOOTPRINT.eu External Advisory Group, will share insights from ICT Sector Guidance for the GHG Protocol Product Standard, which provides detailed guidance for the foot-printing of ICT products and services in the following areas: Telecommunications Network Services, Desktop Managed Services, Cloud and Data Center Services, Hardware, and Software. Andie’s presentation will provide an overview of the structure and applicability of the ICT Sector Guidance. ICTFOOTPRINT.eu is organising its 5th webinar on 27th April 2017, 12:00 CEST to help you manage the energy consumed by ICT and know how Life Cycle Assessment (LCA) can guide you to make your ICT more sustainable. All those who want to become more sustainable in ICT are welcome to join us in this exciting webinar. Jean-Marc Alberola, Group Energy Strategy leader at Airbus & Vice Chairman of ETSI ISG OEU (Industry Specification Group Operational Energy Efficiency For Users). Jean-Marc will speak about the work developed by ETSI ISG-OEU, operative KPIs that enable the monitoring of the energy management performance in data centres and ICT sites. After a short description of the global KPI DCEM, the presentation will focus on the implementation of these KPI’s in an industrial area of corporate ICT sites. Fadri Casty & Tereza Lévová, both from EcoInvent, , the world's most consistent & transparent Life Cycle Inventory database. The ecoinvent database provides well documented process data for thousands of products, helping you make truly informed decisions about their environmental impact. Fadri and Tereza will demonstrate the value of doing LCA on ICT equipment. Berina Delalic, from multEE will introduce the Monitoring & Verification Platform (MVP), a web based tool developed to calculate and store data about energy and CO2 savings resulting from implemented energy efficiency measures. Having in mind central role of ICT especially in the commercial sector, some methods are developed for improving ICT’s energy efficiency, and therefore achieving CO2 emission reduction. The presentation will show how MVP can be used for measuring results from the activities that enable more efficient use of energy for ICT in commercial buildings. The webinar will be moderated by Silvana Muscella (Project Coordinator of ICTFOOTPRINT.eu and CEO of Trust-IT Services) who has broad experience in stimulating topics in the ICT sector. The 4th ICTFOOTPRINT free webinar has crucial information on ICT Calculation tools and Sustainable ICT insights on energy savings, on 23rd February 2017, 15:00 CET. Thomas Corvaisier (CEO of GREENSPECTOR) will introduce the concept of software eco-design, and tell us how it may help lowering the consumption of IT resources while preserving performance and user experience. Frédéric Croisson, from Deloitte Sustainability, will showcase the ICTFOOTPRINT.eu Self-Assessment Tool for Services (SAT-S), a useful, quick and easy-to-use tool that calculates the carbon footprint of your ICT services. The tool helps users not only to make informed decisions about how to make an ICT service sustainable, but also discover the impact of ICT devices & activities in terms of Green House Gas emissions and primary energy consumption. (SAT-S will be launched very soon). Karen Robinson will share some sustainable ICT practices and introduce the save@work initiative, which encourages public sector employee’s to come together in teams to reduce the energy consumption of their building by making small changes to their everyday energy consuming behaviours. Adding an element of competition to the project has been a significant driver in encouraging teams to really examine and challenge those unconscious energy consuming behaviours. The scale of working in a large office has also highlighted those practices that on their own seem to make almost insignificant savings but when applied across an office of over 300 people, have a very different impact. The webinar will be moderated by Silvana Muscella, Project Coordinator of ICTFOOTPRINT.eu and CEO of Trust-IT Services. Silvana has a broad experience in ICT sector, focusing on high-level strategy building, the delivery of multichannel platforms, business acquisition & development & strategic marketing for international clients. ICTFOOTPRINT will hold a free webinar about ICT Standards for Data Centres and ICT Sustainability on 20th December 2016, 15:00 CET, open to all those with an interest in becoming more sustainable in their ICT. During the 1-hour webinar, Lance Rϋtimann (Vice President of The Green Grid) will share his views and tips, on how the European EN 50600 Series of Standards came about as a motivation to deliver a comprehensive EN standard for Data centres to help rise to the challenge of various situations such as one room to multiple building facilities and diverse business models with individual complexities. Moreover, Joe Baguley (Vice President & Chief Technology Officer, EMEA at VMware) will provide us with stimulating insights on some major recommendations that VMWare works on whilst minimising its ICT corporate footprint, described in VMware's Global Impact Report 2015 - Force for Good. Plus, Jean Manuel Canet (Vice-Chairman Working Party “ICT and climate change” at International Telecommunication Union) will explain some ITU-T methodologies for a sustainable ICT. 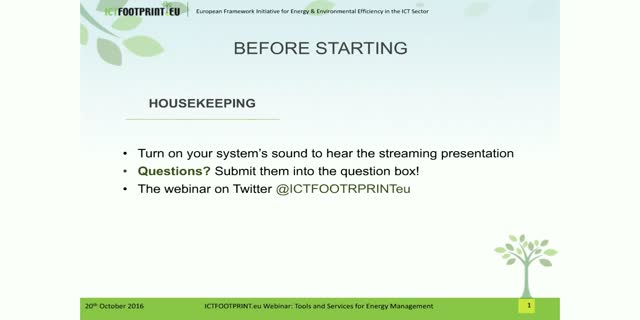 This is the first ICTFOOTPRINT.eu's webinar. It explains how ICTFOOTPRINT.eu services work and the principal benefits for small & medium organisations to engage with low carbon footprint solutions.